Unlike Spiderman 3 - which I had seen the day before - Pirates 3 lives up to its predecessors. But before I start singing its praises, I should get the negatives out of the way. First of all, it suffers from the same delusion most blockbusters do: it thinks that you can never get enough of frantic action and things blowing up real good. In the around nine hours of my life the trilogy took up, there were way too many extra's throwing around and/or stabbing stuntmen. The fights between ships got a bit boring: during most of them all our heroes and the main villains survived and only hundreds of people we didn't care about got killed. The characters joined us in not caring about any of these people even one little bit, which seemed a bit heartless. There were also a fair share of explosions I - and the movie - could easily have done without. That said, Pirates 3 is a hoot. Some people say the second one sagged, and I do remember liking it less than the first, for the same reasons mentioned above. It was too frantic, too much running around and it felt overlong. The third one also feels a bit on the edge, but to its credit I never found myself looking at my watch. This time there is - again - a lot of running around but there are more and better jokes scattered throughout and there is time for a breather now and then. Good luck keeping up with the plot. Motivations turn with the tide and I lost track of who was double-dealing with whom at some points and I gave up on remembering affiliations and grudges. As did, it seemed, the movie itself. By the end I am pretty sure everyone had screwed over everyone else at least once. 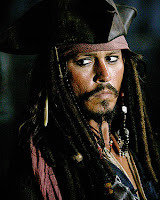 In any case, there is a highly contagious sense of fun throughout, especially when - after a truly bizarre and beautiful sequence, Captain Jack Sparrow (aka Johnny Depp) rejoins the land of the living. He is back in great form, swaggering, shooting off one-liners and doing double-takes with comic perfection. But then the whole cast has a firm grip on their funny bone and credit should also go to the writers: there are some truly inspired ideas, in particular the upside down 'Poseidon' scene. Kudos also for a cool, unexpected twist near the end. Now if only they will quit while they are ahead. Nine hours of Pirates is enough, and some of the elements are already turning repetitive. I hope all involved can resist the urge to milk this cash cow any further, but I am sceptical. However, a short sequence after the end credits gives me a golden sliver of hope. Like a shiny doubloon.